It was brutally cold in Valley Forge, Pennsylvania, on 23 December 1776 when Thomas Paine released the first in a series of sixteen papers entitled The American Crisis. The first paper, which starts out “These are the times that try men’s souls,” inspired a despondent George Washington who ordered it read to his entire army on Christmas night. Later that night the army crossed the Delaware River and the next day won a small but psychologically important victory at the Battle of Trenton. This was the first time Washington’s forces had defeated a regular army in the field and the victory helped secure Washington’s command. Paine spent the 1790’s in Europe where he embroiled himself in the French Revolution. In 1801, First Consul Napoleon Bonaparte invited Paine to dinner. Napoleon claimed he slept with a copy of Rights of Man under his pillow and went so far as to say to Paine that “a statue of gold should be erected to you in every city in the universe.” The respect was not mutual. Paine reported said that Napoleon was “the completest charlatan that ever existed.” It was during this time that Paine published the first two parts of Age of Reason. In 1802 President Thomas Jefferson convinced Paine hold off publishing the third part and invited Paine to return to America. Jefferson, much to the chagrin of the Federalists, also invited Paine to the White House. It was Paine who encouraged Jefferson to offer Napoleon money for the French-controlled territory of Louisiana. In May 1803, Napoleon sold the Louisiana territory to the United States for $15 million. Paine returned to the 277 acre farm in New Rochelle, which the state of New York awarded to him in 1784. However, due to his views on religion and a vindictive letter Paine sent to George Washington, he was ostracized and moved to New York City in 1805. In 1807, Paine published part three of Age of Reason. While the first two parts sold well in American, the third part did not. Paine died in New York City in 1809 at the age of 72. Although Paine wished to be buried in the Quaker cemetery, this request was refused because of his views on religion. Paine’s burial was denied by all Christian cemeteries. Paine was interred in a corner of his New Rochelle farm. His funeral was attended by six people, one of them the casket maker, hoping to get paid. When he was near his end, two American clergymen came to see him, and to talk with him on religious matters. ‘Let me alone,’ said he, ‘good morning.’ He desired they should be admitted no more. As with other recantation calumnies, the lie quickly spread and was believed. The famous English writer and admirer of Paine, William Cobbett wrote a detailed refutation to little effect. It was Cobbett who, in September 1819, traveled to America and dug up Paine’s coffin. Cobbett hastened the coffin on board a ship and took the coffin back to England where he planned to build a shrine to Paine where his body could rest in honor. Paine’s views on the monarchy helped make him unpopular in England and found Cobbett with few supporters. Upon Cobbett’s death, his son assumed possession of Paine’s remains. 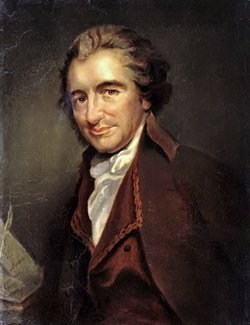 The whereabouts of Paine’s remains has been lost to history. H/T: John E. Remsburg, NY Times, Time, Donald R. McClarey, The History Guide, The Libertarian Heritage. Bernard Bailyn (born September 9, 1922) is an American historian, author, and professor specializing in U.S. Colonial and Revolutionary-era History. He has been a professor at Harvard University since 1953. Bailyn has won the Pulitzer Prize for History twice (in 1968 and 1987). In 1998 the National Endowment for the Humanities selected him for the Jefferson Lecture. He was a recipient of the 2010 National Humanities Medal. BTW, even The New Yorker is now getting IT. Thank fate for escaping the notice of the caring state in all its hijacked extensions for the sake of power and of the bureaucracy; and those misfits that inhabit the posts. I had the opportunity to be of help to someone yesterday that was in an unfortunate situation….. They had to submit to a psychoanalysis for employment in a government job….. Unfortunately the person turned out to be a psychorapist…… It is unfortunate when a trained individual in matters of the mind uses that position to take advantage of others….. The individual had the good sense after the first time to record the next three session…. So far the state is denying liability as the person is not a state employee but independent contractor….. Ya just never know what kinda flakes will pop out of psycho schools…. We will never know in this lifetime if the named would accept the invitations at all….. I am just a dreamer….. But dreams are good…..
A random bit on bullies, a tribute to someone here. Note I said tribute, and it is not GeneH. No named or poorly hidden snark. The readers will have to judge themselves. All will find themselves innocent. We usually do. Me too. A bully is only a quarter man. He can barely stand upright, but he makes loud noises, wild gestures, and impresses the chickens. When joined by another quarter man, he relaxes and finding the support he needs, they walk around with power-drunken swaggers like post-game soccer hoodlums in England thrown out of the pub. A third QM not only increaes the volume, it increases their choice of opponents as they can do the series of attacks tactical maneuvers require. A fourth man is added, and now they feel omnipotent, not only all-knowing. The fourth man becomes the leader, having appraised the others before joining, and knowing that he will be top bully, who administers coup de grace—the ultimate pleasure. Bullies here? No that delusion is gone. Here we are all well-intentioned persons. Need I say more? No one was the target. Only our cultural (genetic?) heritage which comes to the surface occasionally. Who here has not enjoyed the pleasures of bullying? Not I. Tired of dinners? Make a list of those to be consigned to hell. Order not important. They are going in the same shipment, and the Devil will find appropriate punishments for them. the Koch Brothers, Herbert Hoover, Dubja, and Abe Lincoln. Why Abe? Because the devil will treat him to all the pleasures óf hell, just to show the others what they are not getting. Besides he might enjoy the change from a boring heaven. OT Apopros Diogenes finding Thomas Paine. Would Diogenes leave his barrel and clothe himself similar to Paine, acting as political advisor and PR man to Paine. How different would it be today? None, two idealists make no more progress than one, but they keep each other company in a lonely world. Cheech and Chong, David Colbert, Leonard Cohen. and as co-host Benjamin Franklin. C&C would do their schtick. Leonard would declaim some poetry and sing. Tom Lehrer would also sing his irreverent words. Samuel would make dry comments and give his new essay: “Innoccents in Washington”, Jon Stewart could tell us his favorite rant or the one he dreams of doing, etc. Oh yes, Benjamin could tell how really randy it was in Paris among the noble ladies. Well, Erik the Red could bring some from the New World and they all could compare. Don’t forget some Mogen Davids or better vinegar for Falwell. Thanks for Erik the Red. Always glad when credit is given where credit is due. Haven’t you forgot the editors of Hustler? Mightn’t she like a change for once.? Darren, you are on my short list of living personalities with whom I would look forward to inviting to dinner. The ladies of the the U.S. soccer team which won the gold medal in the 1996 Olympics — and not for the reasons Pete might guess, but to thank them for the impact they had on my then young daughters and nieces and all the other young girls just like them. Those same young girls are now the strong, self-confident, capable young women who helped return President Obama to the White House and hopefully will help move this country in a new direction. JC can bring the wine! erik the red because he has the balls to tell a bunch of vikings that the big glacier to the west is greenland. plus he makes my table manners look tame. i might have to watch kennison around Grace though. no way would i let ben franklin near her. If intelligence is a virus, Thomas Paine was deeply infected. Don’t worry though, the majority of the human race seems to be immune from the germ. Popular media 24 / 7 … bombards us with antigens. Gene and Otteray, now that would be a dinner party to remember. That’d be an interesting room, pete, but poor beautiful Grace with Erik the Red and Kinnison? They wouldn’t stand a chance.